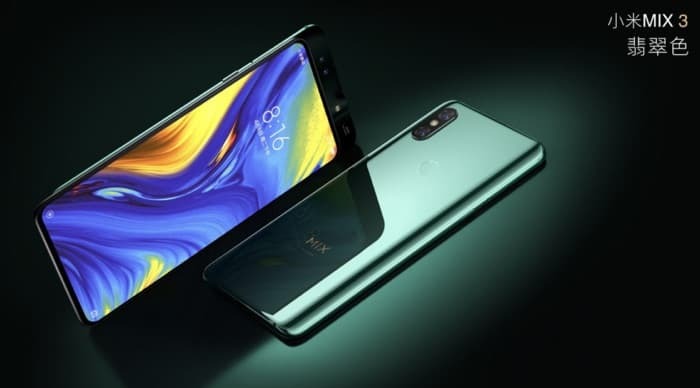 Xiaomi has announced the launch of its latest smartphone, the Xiaomi Mi Mix 3 and the device features a slide out camera. The handset comes with a 6.39 inch display that features a FHD+ resolution of 2,340 x 1080 pixels and a 19:5:9 aspect ratio. The new Xiaomi Mi Mix 3 is powered by a Qualcomm Snapdragon 845 processor and it comes with a range of RAM and storage options. These include 6GB of RAM and 128GB of storage, 8GB of RAM and 128GB of storage, 8GB of RAM and 256GB of storage and 10GB of RAM and 256GB of storage. The Mi Mix 3 comes with a range of high end cameras, these include pop out cameras on the front which includes one 24 megapixel camera and one 2 megapixel camera. On the back of the handset there is a dual camera setup with two 12 megapixel cameras. The new Xiaomi Mi Mix 3will come in a choice of colors that will include Onyx Black, Jade Green, and Sapphire Blue. Pricing for the handset will start at 3,299 Yuan which is about $475 and the top model will cost 4,999 Yuan which is about $720.